Frequency Compensation Techniques for Low-Power Operational Amplifiers is intended for professional designers of integrated amplifiers, emphasizing low-voltage and low-power solutions. The book bridges the gap between the professional designer's needs and available techniques for frequency compensation. It does so by explaining existing techniques and introducing several new techniques including Hybrid Nested Miller compensation, Multipath Miller Zero cancellation and Multipath Conditionally Stable compensation. All compensation techniques are treated in a stage-number-based order, progressing from a single transistor to circuits with six stages and more. 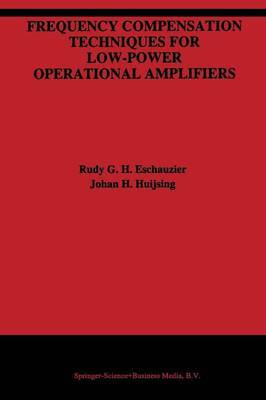 Apart from discussing the mathematical basis of the compensation methods, the book provides the reader with the factual information that is required for practicing the design of integrated feedback amplifiers and many worked out examples. What is more, many bipolar and CMOS operational amplifier realizations, along with their measurement results, prove the effectiveness of the compensation techniques in real-life circuits. The text focuses on low-voltage, low-power integrated amplifiers. Many of the presented bipolar circuits operate at supply voltages down to 1V, while several CMOS amplifiers that function correctly just slightly above this voltage are demonstrated. The lowest measured power consumption amounts to 17muW for a class AB CMOS opAmp with 120dB gain. Despite this attention to low voltage and low power, the frequency compensation strategies provided are universally applicable. The fundamental approach followed leads to efficient compensation strategies that are well guarded against the parameter variations inherent to the mass-fabrication of integrated circuits. The book is essential reading for practicing analog design engineers and researchers in the field. It is also suitable as a text for an advanced course on the subject.